Having the iPhone broken is a big loss. What's worse, you are not able to access the data on your device. Therefore, you may also face data loss at the same time. It becomes painful to digest the dual sad situations. 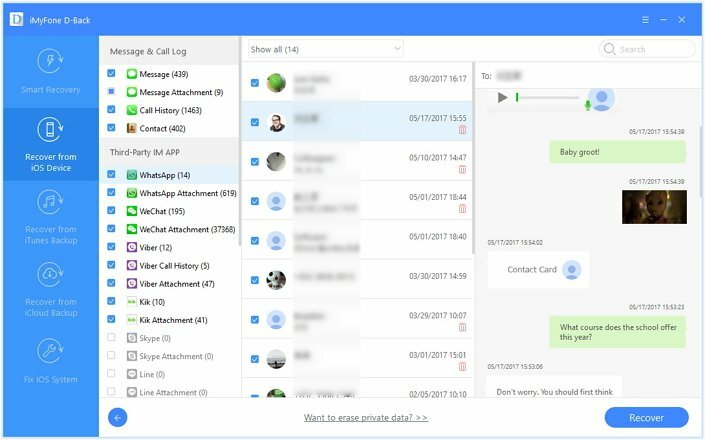 No doubt WhatsApp has gained a lot of popularity and considering the fact that you have many important chats over there in your device, losing them can be a serious issue. If you are wondering how you can recover WhatsApp chats from a broken iPhone and failed to get any reliable solution, your search ends here. We will, through this article will show you how you can recover WhatsApp chats from broken iPhone using the most trouble-free and trustworthy ways. So, stop panicking, throw all the worries away and start recovering your WhatsApp chats now even you are using iOS 12! In order to recover WhatsApp chats from broken iPhone directly, you need to ensure that you have trusted certain computer on your iPhone before or you screen is working in some way. If yes, you can do recovering of chats directly from your iPhone. 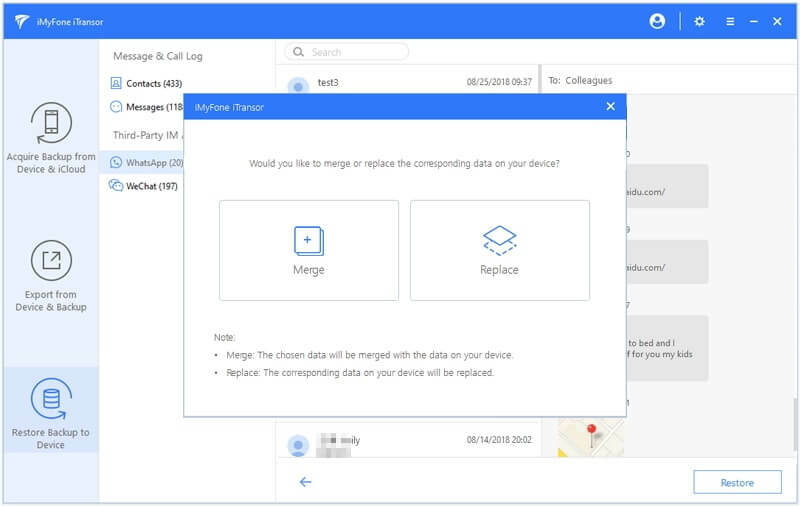 To fulfill this, you need iMyFone D-Back (iOS 12 supported) which is a remarkable third-party tool to recover iOS data easily. 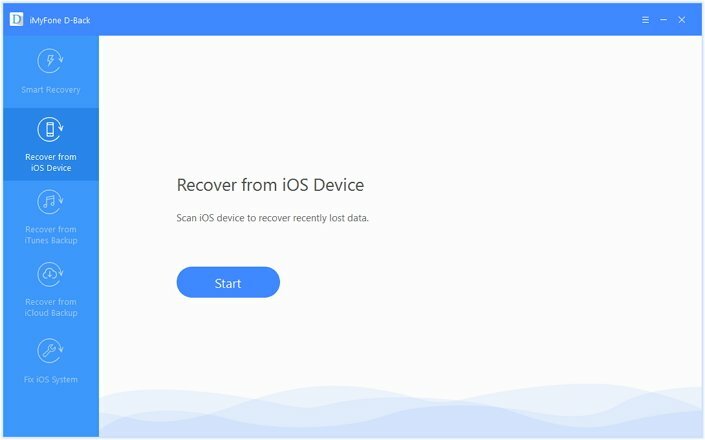 The tool helps users to carry out data recovery from iOS device directly, from iCloud backups and from iTunes backup as well. You can easily use it on your Windows or Mac computers. It is the safest tool available in the market and the easiest too. 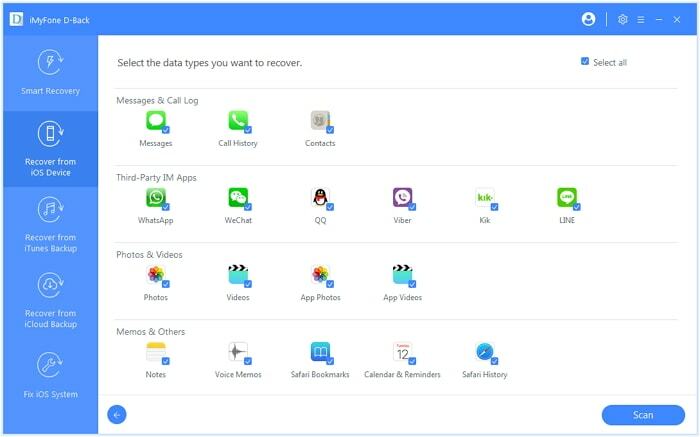 With this tool, you are allowed to recover not just WhatsApp but other 20+ types of data. Follow the guide below for direct recovery of WhatsApp chats from iPhone. Step 1 – Download the tool from the official website and install it. Launch it now and from the left panel, choose the tab that says 'Recover from iOS Device'. Once you do this, hit on 'Start' to begin the process. 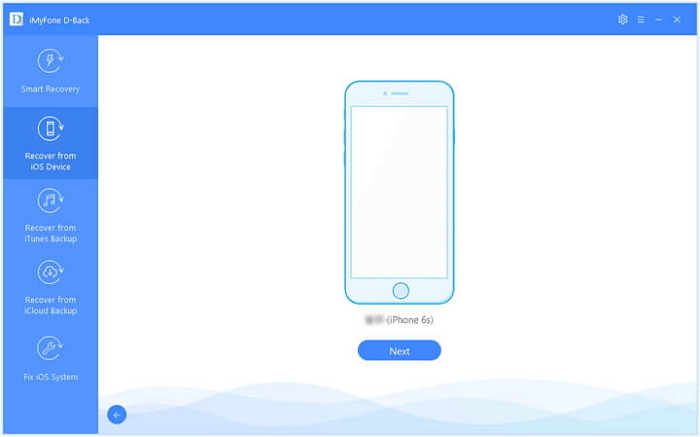 Step 2 – Now, follow the prompt of connecting your iPhone to the PC. Just take an Apple USB cable and plug your device to PC using it. Click "Next". After this, you will notice the data types on your computer screen in an organized way. Step 3 – Hit on 'WhatsApp' from the 'Third-Party IM APP' section. When this is done, you need to click on 'Scan' so that all the WhatsApp chats will be scanned by the program. 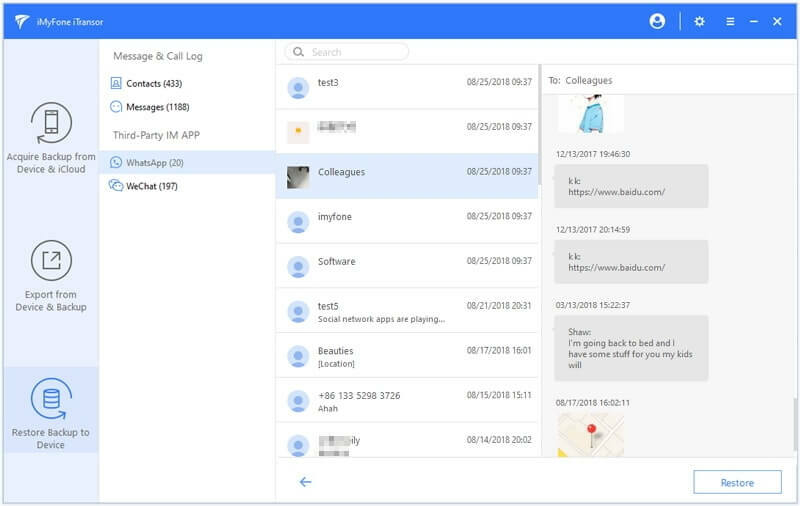 Step 4 – When they get scanned, you will get the opportunity to preview them on your computer screen before retrieving it. Have a look on your chats and select the needed ones. In the end, click on 'Recover' button and you're done. This program offers free trial version and supports iOS 12. Just download it to have a try. After trying the above method, if you get no results, it might mean that your device is dead completely or it is disabled now. In such case, you can only recover WhatsApp chats from backup. We have given you the detailed steps for this too. Scroll down to know more. 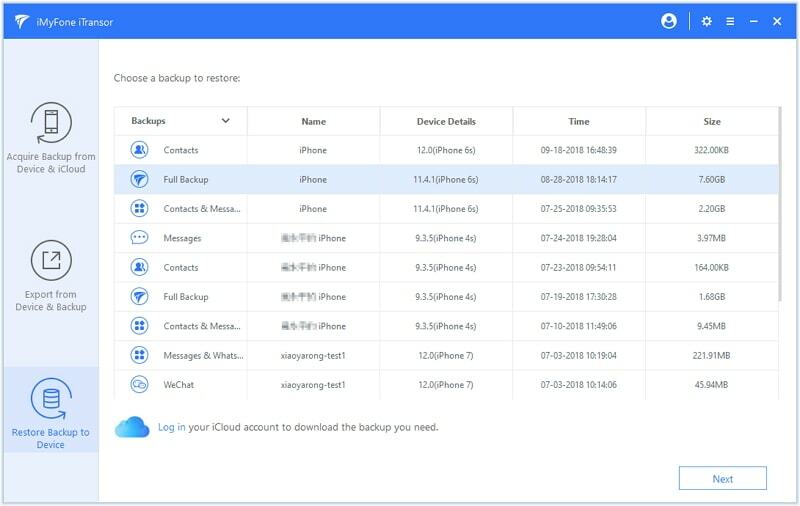 If unfortunately your iPhone is terribly broken and you never trusted any computer on your device, you have to recover data from backup. You can export the WhatsApp data from iTunes or iCloud backup. 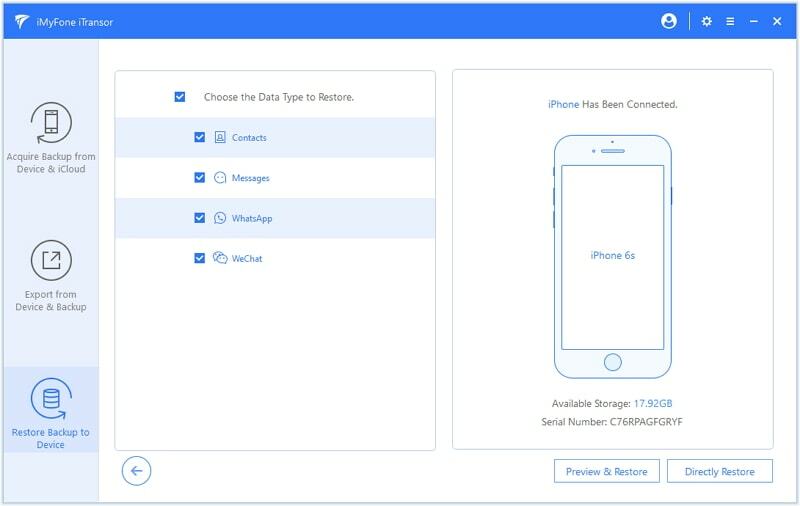 If you have another iPhone, you can use a tool iMyFone iTransor (iOS 12 supported) to restore only WhatsApp chats from iCloud or iTunes backup to your iPhone, and merge with the data on your device. You can also export the WhatsApp data from iTunes or iCloud backup to your computer if you have no another iPhone. Now in this section, we will introduce you how you can restore only WhatsApp chats from iTunes or iCloud backup to your iPhone. Let's get started. Step 1 – If you want to restore WhatsApp chats from iCloud backup, you have to download iCloud backup from your iCloud account firstly. Please click "Download iCloud Backup" from the first tab and then enter your iCloud ID to download the iCloud backup. 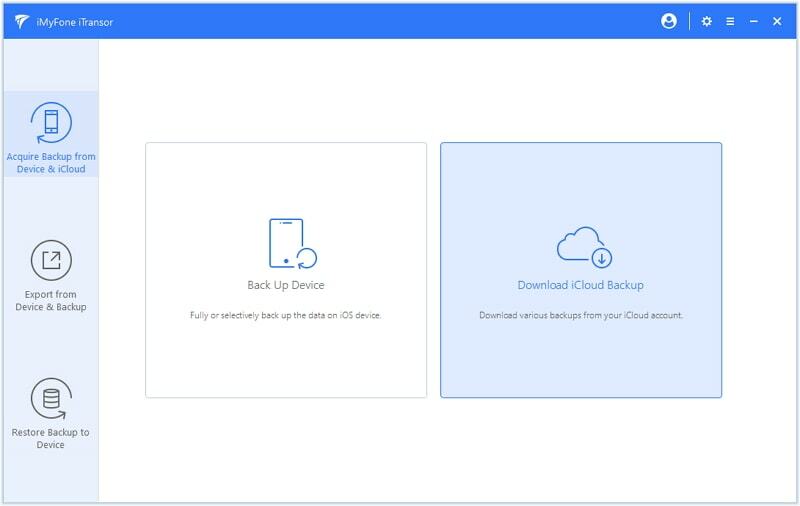 Step 2 – Now click "Restore Backup to Device". You will see a list of iTunes/iCloud backups or other backups displaying on the screen. Choose the backup that you want to restore WhatsApp from. Here we choose an iTunes backup, and then click "Next". 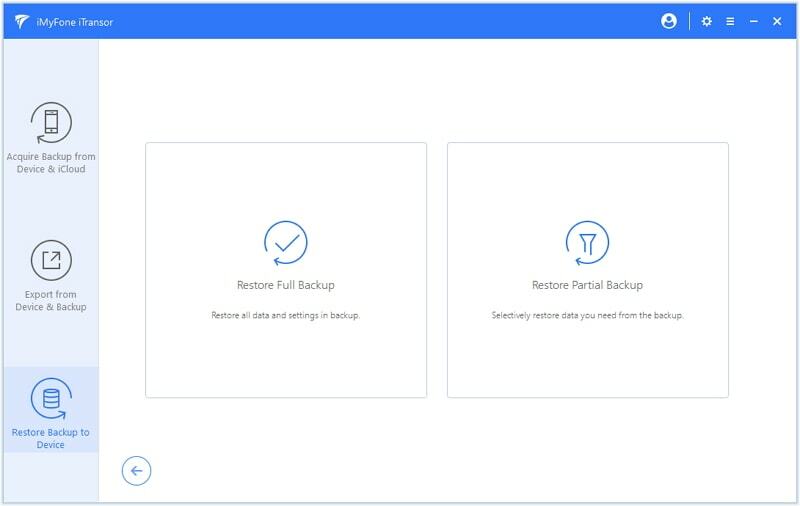 Step 3 – Now, choose "Restore Partial Backup". Choose the data type WhatsApp from the left column and then connect your another iPhone with the computer. If you still want to preview your WhatsApp chats before restoring, click "Preview & Restore". Step 4 – Subsequently, the selected data type WhatsApp will be scanned and you will be able to preview the conversations on your screen. Hit on "Restore" button. Choose "Merge" or "Replace" option based your own needs.Then you will have the WhatsApp chats recovered on your another iPhone.